The Nintendo Switch is a fantastic handheld system, but one of its most prominent shortcomings is its battery. Graphically intensive games such as The Legend of Zelda: Breath of the Wild will run the console out of juice in about 2.5 hours, give or take another 15-20 minutes if you drop the brightness and mute the sound. While you can still manage a decent gaming session in that amount of time, there’s certainly room for improvement. Until the Switch inevitably gets a form factor refresh that hopefully packs in a better battery (and maybe a Pascal-based Tegra? Please? ), InDemand Design’s SwitchCharge promises to bring that battery life up to 12+ hours, as well address a few of the console’s other weak design elements. The SwitchCharge is the world’s first multifunctional battery case designed for the Nintendo Switch. It incorporates a high capacity 12,000mAh battery, an improved kickstand, 2 game card slots and also added protection for your Switch. In their promo video, InDemand Design points out that external power banks are not designed to support the Switch’s power consumption needs. Charging the system while trying to prop it up on its own embedded kickstand is impossible due to the fact that its single USB-C port is on its underside. The Switch’s own kickstand is flimsy and disappointing and only props the system up at a single, shallow angle when set up for tabletop use. The SwitchCharge is being designed based on user feedback so that gamers can get the most out of their Switch. It’s a thin, lightweight case that locks into place over the Switch, and can be easily removed. Its main feature is its 12,000mAh battery, which has been designed specifically to meet the Switch’s power draw. External ports are now accessible from the sides, just behind the Joy-Con controllers, and LED battery indicators let you know how much charge is left at all times. A much more stable and sturdy-looking kickstand lines the back bottom-half of the SwitchCharge, and can fold out to multiple angles. 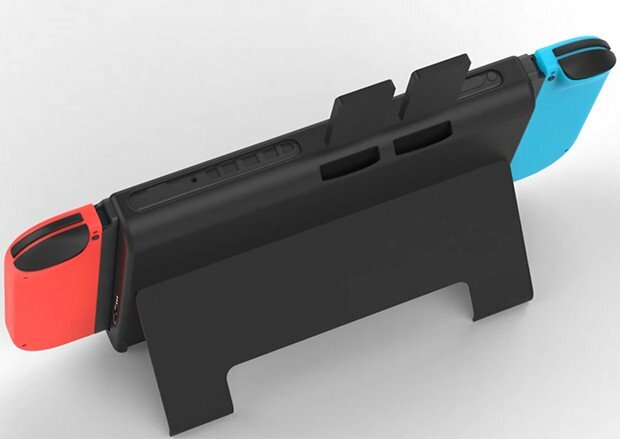 This is a welcome improvement over the Switch’s original and somewhat baffling kickstand that almost guarantees the system will fall flat on any surface on which it is placed. A pair of slots for storing game cards is also a nice convenience, however, they most likely won’t improve how bad the game cards taste. As the SwitchCharge gears up for mass production, the Indiegogo campaign offers gamers a chance to pre-order the peripheral. For $85 USD, you can order a SwitchCharge with its power supply, or you can grab two for $140. There are also screen protectors offered alone at a $15 tier and bundled into other tiers, however, the campaign page doesn’t appear to include any information about them. Given that the design of the SwitchCharge leaves the screen of the Switch uncovered, it looks like it would work well with the amFilm Tempered Glass Screen Protector, which we highly recommend. With a whole month left to go, the Indiegogo campaign is currently at 170% of its requested funding. A whopping 1,464 backers have contributed 136,157 over the original $80,000 goal. Pre-ordering now is most likely going to be the best way to get the SwitchCharge below its potential retail price.